My physical science students are starting our first unit that addresses the periodic table. I decided to kick off this unit by reviewing the three types of subatomic particles. This is a review for all of my students, so I decided to use it as a way to gauge how much they remember from their middle school science classes. Given the names of the three subatomic particles, I challenged them to give me the particles, location, mass, and charge. 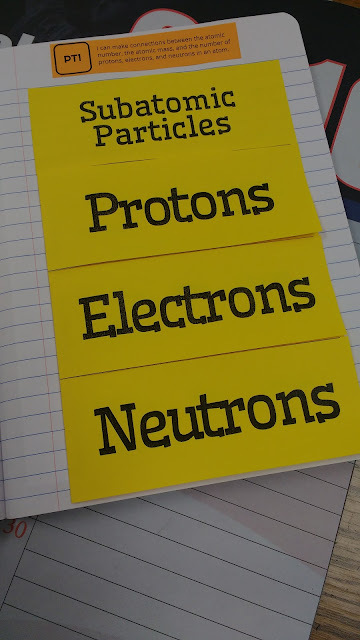 This is a four-flap foldable, but I had my students cut off the first flap to reveal the title, "Subatomic Particles." When I asked my students where the protons were located, several students suggested "center" or "middle." 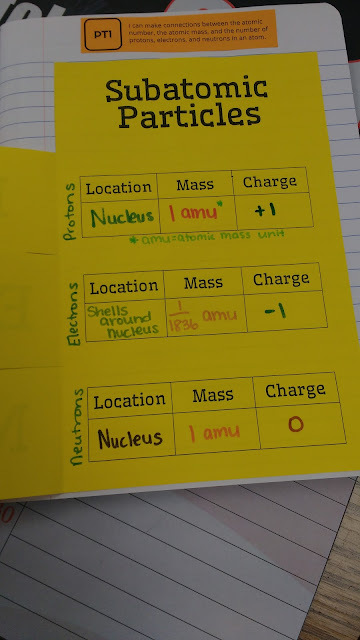 I was VERY shocked when they couldn't come up with the word "nucleus." I even gave them the first letter as a hint. Nope. Nothing. Then, there was the student that told me a proton weighed a pound. Yup. A pound. When I said that was incorrect, another student offered the answer of a gram. No again. The mass of a paperclip is around a gram. A proton is MUCH smaller than that. This led to talking about how atoms and protons are on such a small scale than anything we can easily measure the mass of. If I'd been on my game, I would have given them a conversion factor to relate atomic mass units to grams! Another interesting conversation that happened as a result of this foldable regarded the mass of an electron. One student guessed that an electron had a mass that was half of a proton. Nope, smaller. One fourth? Smaller. One eighth? Smaller. One sixteenth? Smaller. At this point, I told her that we'd be here for days if we kept it up at that rate. I was just going to spoil the beans and tell them. Enough rambling...Here's the link to download the file for this foldable. The font is Wellfleet.